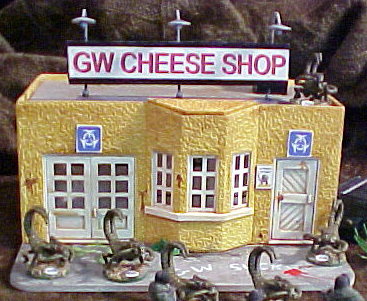 GW produced a lot of 'cheese' but had to get it to the public. 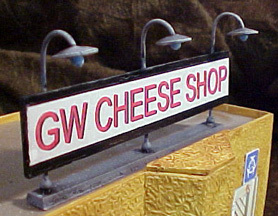 They opened more and more shops, running real cheese shops out of business. The shops were brightly coloured, and brightly lit, possibly to make up for the dimness of the staff. Disconcertingly, there were always odd little creatures called 'fangboys' underfoot, filling the air with their mindless chittering, and an odd, vaguely unwholesome smell. The doors were always decorated with the kewl (and government-mandated) 'chaos rune'. The front of the shop was usually marred with a bit of oozing, and with dookies thrown by passers-by. 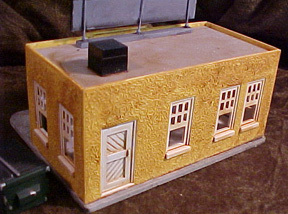 The top of the front alcove is sloped to accomodate the kit roof. I used part of one undercut to cover this, and to fill the back of the alcove at the top. The roof is cut from plastic sheet, and the base from Cintra. The air-conditioner is a lego brick and flat cap. The lights were made from wire, thumbtacks and plastic pearls, and all signs were printed on my computer. 'Oi! Where's me Brain? ': An earlier product, playing up GW's mind-numbing qualities. A bit of editorializing on the sidewalk out front. Judging by the blood smears, the fangboys won this one. 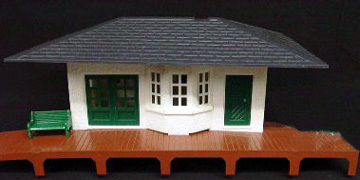 The Suburban Station is readily available as a new kit, but is also one of the most widely available kits avaliable as a set of broken parts on ebay, usually as part of a larger lot of buildings and parts. 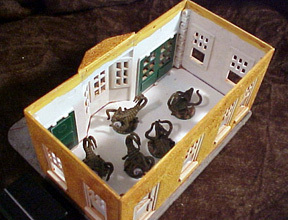 Usually, the roof and platform are broken or missing, and all you get are the 4 body pieces seen here. To use them as the basis of a stand-alone building, remove the bottom 20mm of each wall: You can use the internal locking pegs as a guide for your cuts.